Read here about the use of the term "tensegrity" in ways related only to the "mood" or general impression of the term, with little or no reference to its structural implications. As tensegrity is popularized, many people use the word for its connotations alone, disregarding any semantic, well-defined reference to the meaning of the term. Such association of tensegrity with various works or acts may be by name alone, or by some general, difficult to specify mapping of the "mood" of the word tensegrity with the "mood" of the referent. This article is included in the Encyclopedia of Tensegrity because any use of the term tensegrity and its connotations may be of significance. While we may fail to map any specific aspect of tensegrity to the named works below, such a hard-to-define mapping of tensegrity to human production may still be a valid area of rigorous, purposeful, scholarly study. In 2012 videos started to appear of people dancing with wildly gyrating motions. The trend bares some resemblance to the Harlem Shake fad. Below, a few examples. 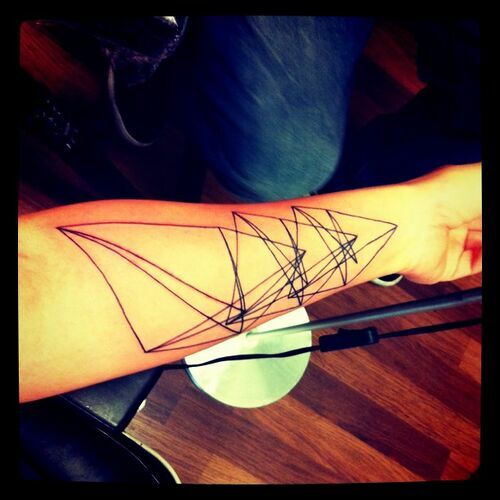 Tattoo of Tensegrity Tower, by Miss Venom.